It can even be found in non-food products like soaps, detergents and personal hygiene products. 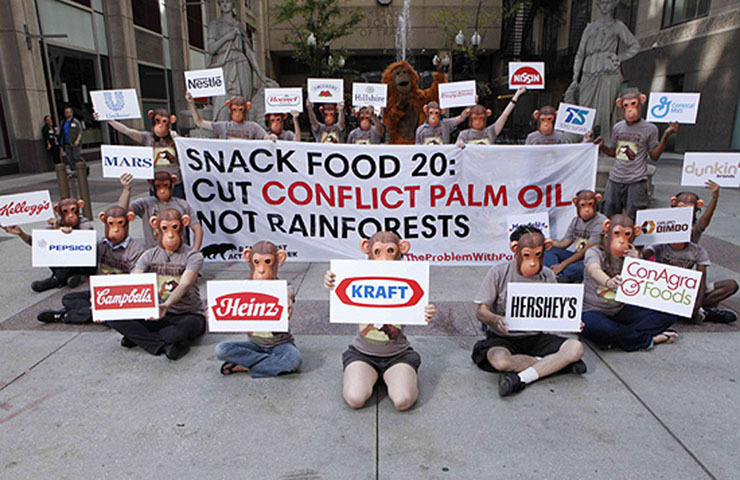 In the report “Conflict Palm Oil: How US Snack Food Brands are Contributing to Climate Change and Human rights Violations,” Rainforest Action Network is calling on global food manufacturers to adopt responsible palm oil policies and commit to using only traceable palm oil that is free of deforestation and human rights violations. The report identifies 20 of the largest and most influential snack food companies and assesses their palm oil purchasing commitments and short falls. 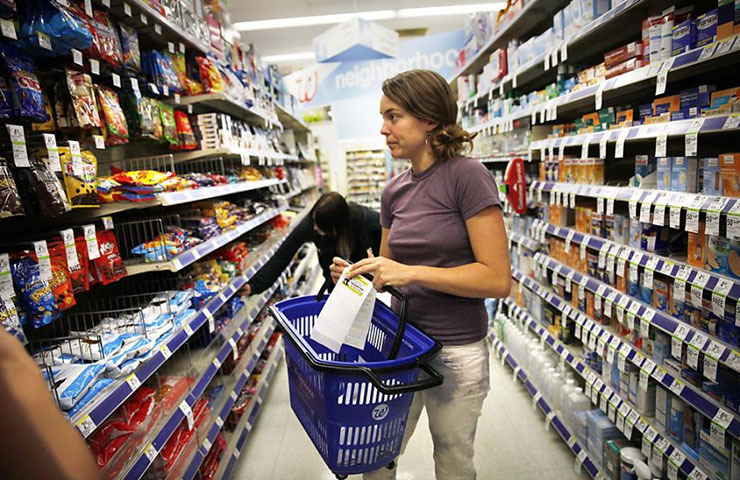 The “Snack Food 20” include: Campbell Soup Company; ConAgra Foods, Inc.; Dunkin’ Brands Group, Inc.; General Mills, Inc.; Grupo Bimbo; Hillshire Brands Company; H.J. Heinz Company; Hormel Foods Corporation; Kellogg Company; Kraft Food Group, Inc.; Krispy Kreme Doughnuts Corp.; Mars Inc.; Mondelez International, Inc.; Nestlé S.A.; Nissin Foods Holdings Co., Ltd.; PepsiCo, Inc.; The Hershey Company; The J.M. Smucker Company; Toyo Suisan Kaisha, Ltd.; and Unilever. With an estimated 74% of the world’s palm oil being used in food products and cooking, each of these companies has considerable buying power and can greatly influence the way palm oil is produced by demanding conflict-free palm oil from their suppliers. Global trade of palm oil is controlled by a small group of international suppliers, including Cargill, ADM, Wilmar, IOI, Bunge, AAK, Fuji Oils and KLK. It is up to these traders to insist that the palm oil they buy and supply to food manufacturers is full traceable and not associated with deforestation or human rights violations. Conflict palm oil is produced under conditions associated with the ongoing destruction of rainforests, expansion on carbon-rich peatlands, and/or human rights violations, including the failure to recognize and respect the customary land rights of forest-dependent communities and the use of forced labor and child labor. Responsible palm oil is palm oil that is produced without contributing to deforestation, expansion on carbon-rich peatlands, and/or the violation of human and labor rights. Responsible palm oil is produced legally and can be verifiably traced back to the plantation where it was grown. The term RSPO “sustainable” palm oil has been diluted by association with the weak certification standards of the Roundtable on Sustainable Palm Oil (RSPO). It has been further diluted by the many companies who buy GreenPalm certificates (which provide small monetary support to producers following the RSPO “sustainable palm oil” standards), rather than buying segregated RSPO-certified palm oil (which is sourced from a known RSPO certified producer and is not mixed with controversial sources at any point in the supply chain) or, better yet, responsible palm oil. These companies can then put the GreenPalm logo on their packaging and websites to make the palm oil in their products appear sustainable, but in reality the company still buys conflict palm oil and pays a very low fee to “offset” their palm oil use. Many companies are buying mass balance RSPO-certified palm oil (which allows mixing of RSPO-certified palm oil and non-RSPOcertified palm oil) and claiming they are sourcing 100% sustainable palm oil. There is growing concern that this amounts to little more than a greenwashing tactic to the point that “sustainable palm oil” is no longer a useful term to distinguish good palm oil from bad. Companies that produce, trade, and use palm oil must go beyond the inadequate “sustainable” standards of the RSPO to be truly responsible. Transforming the way palm oil is globally produced is critical to protecting the world’s tropical rainforest and critically endangered wildlife who depend on them. From growers and suppliers to food manufacturers and consumers, we all have a role to play to ensure that conflict palm oil is removed from the market.